This Antenna-Coupler kit, with classic spider-web coil design, is perfect for parents, grandparents, and teachers to build with kids! It is also a super starter kit for the beginning adult builder! All parts included are coil form, wire, variable tuning capacitor, other necessary components. Easy parts layout guide provided for kids. Excellent performance from this unique and classic spider-web, high "Q" coil design. 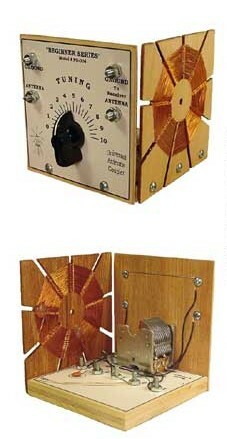 This kit works nicely with all the other "Beginner Series" kits, or most other radio kits and projects. A nice addition for the advencing experimenter would be the book, "Radios That Work for Free". All are found here, amongst our other fine collections! Truly, a "classic" in beginning crystal radio! Demonstrates differing methods of coupling antenna and ground to receivers, to gain the most efficiency.